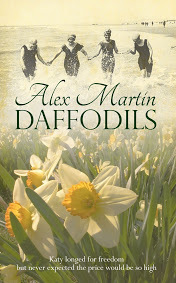 Alex Martin has crafted a wonderful story. I adored reading it and was replete with an ending that is completely right and satisfying . It's a rich feast of a book. The characters are vivid taking you on a fascinating journey. It's the kind of story you become so absorbed in nothing else matters. The twists and turns of the action are emotionally charged. I was up; I was down and all over the place breathless with anticipation of what was to come. It's a sweeping tale that gives so much to the reader - insight into what life was like for Katy a young servant girl in the early part of the last century; dreadful suffering of so many young soldiers and the wounded of WW1 as well as life back home for families struggling to cope without their men folk. Katy leads the action and you'll find yourself chewing your lip, biting your nails and praying she makes the right decisions. What are the dilemmas she must wrestle with? You'll have to read the book to find out and believe me you'll read it again and again. As you can well imagine, this first response is very welcome. As more reviews come in, they will be posted here.